At a recent innovation keynote speech I gave to Fortune 500 women executives, sponsored by Cognizant Technology Solutions, we examined some of the reasons fewer than 19 percent of all patents in the world are secured by women. This isn’t patents held by a single woman, but patents that have at least one woman listed on them. Fewer than 8% of all patents have a single woman as the primary patent holder. This is still a dismal number, but better than it was 40 years ago when only 3 % of patent holders in the world were women. In doing some research into why this number is so low, I discovered that, even though things have changed enormously in society for women, we still have a long way to go when it comes to intellectual property ownership. When patent Law was passed in 1790, women were granted the same privileges as men. Even though single women could do whatever they wanted with their patents, married women didn’t have the same rights. Their husbands owned everything, including their patents. It would take another 50 years for the laws to change and 130 years for women to even get the right to vote! So, now that women can vote, own property, and invent, why don’t they? Between scientific studies and my own personal polling, I discovered that the answer wasn’t what I thought it was. The obvious answer is that there is still a very small number of women in STEM careers. But that doesn’t answer the question about why there are so few women inventors. I’m a patent and trade dress holder, but I certainly don’t have any kind of background in science or engineering. Even though my product isn’t technology based, you still don’t have to have a STEM degree to have a technology based patent. A great example of this is Hedy Lamarr, inventor of spread spectrum technology for use in radio guided torpedoes. Her background was the same as mine…actor. She had no formal degree in science or engineering. She simply saw a problem that needed solving, (safely controlling torpedoes with a radio signal), and was able to apply the system of electro-mechanical technology of player piano rolls to come up with a solution. The World Intellectual Property Organization, global experts in IP policy, completed their study of gender in inventing and found higher numbers of women inventors in biotech and pharmaceuticals. The women patent holders in biotech was an impressive 58% and in pharmaceuticals it was an equally impressive number at 55%. But the least women patent holders were found in mechanical elements at 11%, transport at 13%, Machine tools at 14% and engines at 15%. According to WIPO Director General Francis Gurry, “The new global data give us a baseline for understanding the role of gender in the filing of international patent applications, which is one metric used in measuring a country’s innovative capacity. These data prove that a gender gap exists and it needs to be addressed”. This brings me to why I feel there aren’t more women inventors. It’s the same reason there aren’t more women in STEM careers. As far as we’ve come in society for women, there is still a lot of bias that remains. When I ask people in the audience to name an inventor, I rarely get anyone who names a woman inventor. Women have invented all kinds of things that have shaped our world, but they don’t get the same recognition male inventors do. Also, girls aren’t encouraged to invent. One way to change that is to make inventing cool. Get girls involved at an early age. After leading several Girl Scout creativity workshops, I can tell you that I was very impressed at how creative and innovative the girls were. We need more of that. More programs for girls to get them involved and excited about inventing. Women have a lot to contribute to the world and we need more women inventors. Inventions are created because someone had a problem that no one else had solved. So women, the next time you come across a problem that no one else has solved… invent it yourself. Because your invention just might change the world. Inventors and innovators are a unique breed. Creative Innovation would like to spotlight those people who have helped change the course of history or simply made life better and easier through their innovative products, designs or processes. 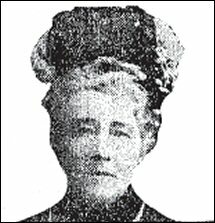 We’ll start with the editor of The Woman Inventor, Charlotte Odlum Smith, a woman who tirelessly worked to champion the rights and accomplishments of women inventors. Smith wasn’t an inventor herself, but she had a passion for women inventors. This passion was fueled by her friend, inventor Mary S. Mary who created 53 inventions, including some on mechanical devices, but lacked the money and knowledge to get them to market. She ended up selling them for as little as $5.00 a piece to men who had the finances and connections to get them launched. The men went on to patent the ideas in their own names and enjoy great financial rewards. Mary S. died penniless and was buried in a pauper’s grave. But before her death she begged Smith to make sure justice was done to women inventors. The first thing Smith did was to ask the patent office for a list of women inventors from the time the office opened in 1790. She wanted to see for herself how many women inventors were out there. This request would prove to be more daunting than she imagined. It took 10 years to obtain the list. She also urged the government to reduce the fees inventors had to pay and asked that they reward patent holders with money to improve their inventions. For women inventors she asked the government to extend protection to women patent holders and that they prosecute those who infringe upon the patents. She also asked for a permanent display at the Patent Office honoring women’s inventions and an open invitation for women to attend an inventor’s association at the Patent Office centennial. Charlotte Smith continued her fight for women inventors until the day she died. For someone who was always in the spotlight where everyone knew her name, she died alone and was buried in an unmarked grave. But we honor her sacrifice and dedication in the Inventor and Innovator Spotlight.